programs of the Russian Federation. encouraging the attraction of private investment in government projects. Key words: Management, University, Structure, Promotion, Development. reflect program items and budget expenditures . investments, intergovernmental transfers, government procurement, etc. fundamental legal acts in force in the country. as the ―Electronic budget‖ IIS) during financial operations. passports of these state programs. characterize the latter‘s maintenance of both financial and management accounting. financial support for state programs. science, in particular, the specifics of financing state programs. of treasury approval of operations accompanied by government contracts agreements. agreements has been recognized as successful and received its continuation in 2017-2018.
increasing requirements for government contracts, providing for advance payments, etc. technological complex of Russia for 2014-2020" (hereinafter - FTPIR)). budget and cash limits (Japan). 3.5. The results of a comparative analysis of 4.5 and 4.4.
financing systems is unique and applicable to a particular state. (pdf format) by the Treasury of Russia for budget execution . analogy with public financial management systems in Brazil and South Korea. Russian financing system, the ability to adapt existing foreign practices to the Russian reality. mechanisms for authorizing budget expenditures. Secondly, permanent modernization of the regulatory framework in the public sector. (treasury and bank execution of government contracts). Fourth, ensuring openness and transparency of funds. science to the new conditions of functioning . estimates, incremental and program . regarding the development of education and science. down into the following periods. the development of federal treasury bodies, etc. year, "On Education", "On Science and State Scientific and Technical Policy ". priority areas of science and technology. provision of services for state and municipal needs‖). modernization of regional education systems. organization of military contract training and provide them with benefits. their continuation in the framework of existing activities of the GPRO. Introduced a long-term FTPIR (2007–2013). the process of bringing accounting and reporting to international standards is underway. accessibility and improve the quality of services for additional education of children. developed and introduced, which operates from 2009 to 2013.
on the patriotic education of citizens (2011–2015) starts its development. with the strategic goals of the state. Since 2012, it was launched of the implementation of GPRO and GPRNT for 2013–2020. etc. FTSPIR is introduced in 2014–2020. problem situations and prevent deviations implementation from planned . comparison with costly financing . institutions in the management and to achieve the planned result. Simplify the budget structure, increase information transparency and accessibility. The establishment of functional links between the budget and the strategic goals of the state. Improving the efficiency and effectiveness of sectorial departments. Achieving efficient use of budgetary resources. equal to the balance of project content, cost and time‖ . improving the efficiency of use of labor, financial and other resources, etc. information support of public finance management. accessible additional education for children. synchronous increase of the effectiveness of the education system at all levels of education. 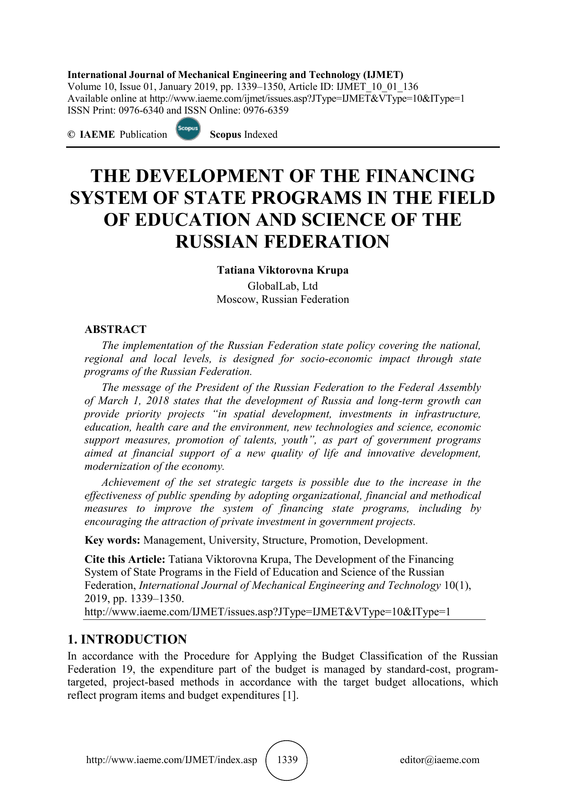 approval of the state program of the Russian Federation ―Development of education‖ . integration of public financial and regulatory measures. financial and management analysis, etc.). system of financing state programs of the Russian Federation to be taken into account. Agreement #14.576.21.0100 of 26 September 2017 (unique identifier of applied research RFMEFI57617X0100). Advanced Research in Law and Economics, 7(6), 2017, pp. 1248–1262. Berlin Heidelberg, 2010, pp. 451–460. management. Scientific and Technical Information Processing, 36(6), 2009, pp. 323–331. Casteen, J. T. Effective University Management in Difficult Times. In: N. C. Liu, Q.
Sustainability Construction at The University of São Paulo, Brazil. In: W. Leal Filho, C.
Research and Practice Dordrecht: Springer Netherlands, 2003, pp. 55–66. Internet Database System for University Management Support. In E. Tkacz and A. Institutional Governance in the Eyes of Academics in Europe. In U. Teichler and E. A. Survey in Twelve Countries Dordrecht: Springer Netherlands, 2013, pp. 183–203. Lahoud, I. and Chamekh, F. Towards an Architecture for Universities Management. In: P.
International Publishing, 2017, pp. 69–81. Skeptics‘ Dictionary London: Palgrave Macmillan UK, 2006, pp. 102–104. University Management. Higher Education Policy, 26(4), 2013, pp. 523–550. Wroblewski, A. Feminist University Management: Precondition or Indicator for Success? Management. Journal of the Knowledge Economy, 6(3), 2015, pp. 522–550.